Hugo is a DREAMer who came to the United States at ten years old in 1995. His parents brought him and his brothers and sister to go to school. He grew up in a Christian home and has always known the United States as his home country. He didn’t know about his status until he got to high school and his other friends were getting driver’s licenses and he couldn’t. After he finished high school, he started volunteering for a non-profit organization called Young Life where he worked with at-risk youth. He was a mentor for students who were struggling in school and at home. During that time, he was working as a server at a restaurant. 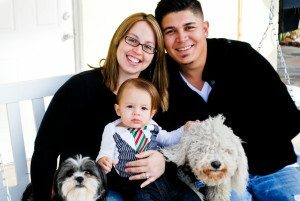 He married his wife, Leslie, who is an Arizona native, a U.S. citizen and works for the state’s Child Protective Services. In the summer of 2011, Hugo was arrested by the Maricopa County Sheriff’s Office while conducting a worksite raid at the restaurant where he worked. He spent three months in county jail. His wife was pregnant with their first child while he was in jail. He was charged with attempting to use the identity of another, a felony under Arizona law. He would like to apply for DACA, and his brother and sister have already been granted the temporary deportation relief under DACA. Hugo and his wife now have two children, Jayden and Hailey. He would like to go to university and study public relations. He is now in removal proceedings and faces permanent separation from his family.